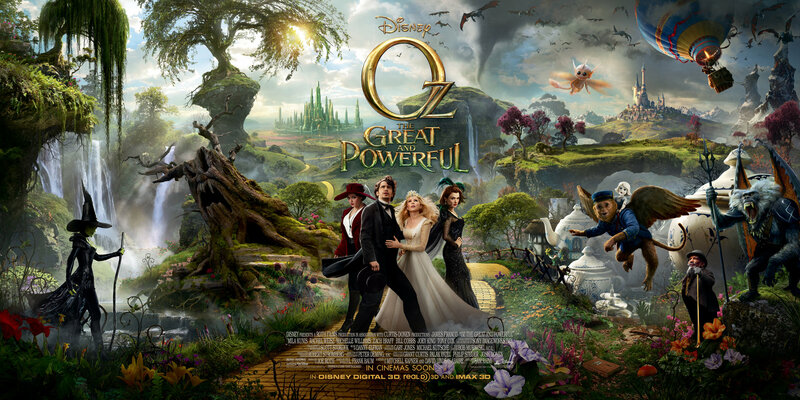 Oz the Great and Terrible Powerful – I finally got around to seeing this one, and while it wasn’t as bad as I feared from some of the reviews, I do have some bones to pick with it. First, though, the movie is a prequel, but what is it a prequel to? As much as it claims to be based on the works of L. Frank Baum, it really didn’t pick up on most of the hints about the Wizard’s past that we’re given in his books. Okay, the Wizard was a circus performer who arrived by balloon and was hailed as a great wizard, and they did include his full name as given in Dorothy and the Wizard in Oz. On the other hand, he didn’t build the Emerald City (it was already there), give the baby Ozma to Mombi, or get driven out of the West by the Winged Monkeys (although he did have to deal with them). It’s much more of a prequel to the MGM film, although since Disney doesn’t own the rights to that movie, they had to change some things. There’s also the issue of how you can have a prequel to a story that turned out to be a dream. The new film uses elements of the dream motif, like the switch to color upon reaching Oz and the fact that some Ozites resemble people from Oscar’s life in the United States, but there’s no indication that it’s supposed to be a dream. Not a big deal, but worth mentioning, I thought. The movie has been accused of being anti-feminist, and I can see some of their points, particularly with the character of Theodora (and I’m sure it was intentional that her name was basically Dorothy’s rearranged). Oscar, who has been established as a womanizer, flirts with her and she thinks they have a future together. When she realizes he was playing her, she decides to become pure evil. Yeah, there was also some manipulation from her sister and an out-of-place reference to Snow White involved, but it’s still a weak origin story. It didn’t help that Mila Kunis was totally miscast in the role. I like her, but she’s about as far from Margaret Hamilton as you can get. Her cackle didn’t work for me, and it was totally ridiculous that at one point she just showed up in a crowd and started yelling “Boo!” Then there’s the costume, which was the wrong shade of green due to copyright issues, but the bigger concern was that it was just impossible to take seriously. 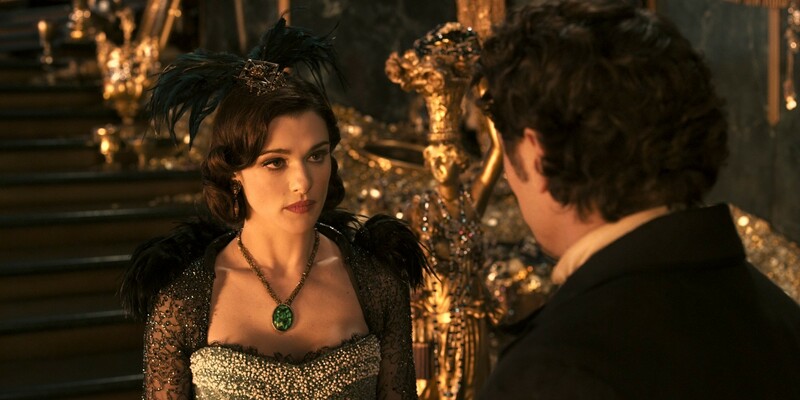 Evanora, played by Rachel Weisz, is supposed to be Theodora’s sister, even though they look nothing alike and she has a totally different accent. And who calls their sister “sister”? I found it kind of difficult to buy that Evanora had convinced the people of the Emerald City that she was good and Glinda wicked when she came across as totally shady. Certainly, once Oscar met Glinda, he immediately bought that Evanora had been lying to him. Was it just because Glinda was pretty and reminded him of someone from his old life? Was it trying to show that you can’t con a con-man? I don’t know, but it struck me as an abrupt shift. Anyway, Michelle Williams as Glinda wasn’t as powerful and competent as she is in the books, but she was closer to that characterization than Billie Burke’s patronizing persona, so that was good. I did like the China Girl character, although I have to wonder why she never got a name. It would have been one thing if it were just Oscar not bothering to learn her name, like how he just called Finley “monkey” up until the end, but other characters simply called her “China Girl” as well. I know the Scarecrow doesn’t have a name either, but he’s one of a kind. The China Girl was from a whole village of china people, so she presumably knew a lot of other china girls. I do appreciate that the China Town was a nod to the books, even if it was only the first one. The China Country in the book knew about glue, though. I saw someone ask in another review why Oscar couldn’t have used his glue to repair anyone else in the village, and I have to reiterate that question. As a fan of the books, I was rather disappointed that they didn’t include more references to them. I know they were mostly going with MGM’s Oz, but they could have thrown in a few tidbits for book fans without going against that. Aside from the ones I already mentioned, there were man-eating plants that might or might not have been inspired by the ones in The Patchwork Girl of Oz, and the Tinkers were probably a reference to the inventors Smith and Tinker who built Tik-Tok. Also, a map that was shown briefly had the Wogglebug’s name on it. Speaking of geography, it wasn’t entirely clear how the movie employed the terms Munchkin, Winkie, and Gillikin. It didn’t seem to be related to where they lived, but more to their functions in society. I guess the Munchkins were little people and the Winkies the tall guards like the Wicked Witch of the West had in the original movie, but what made a Quadling a Quadling? And why no Gillikins at all? 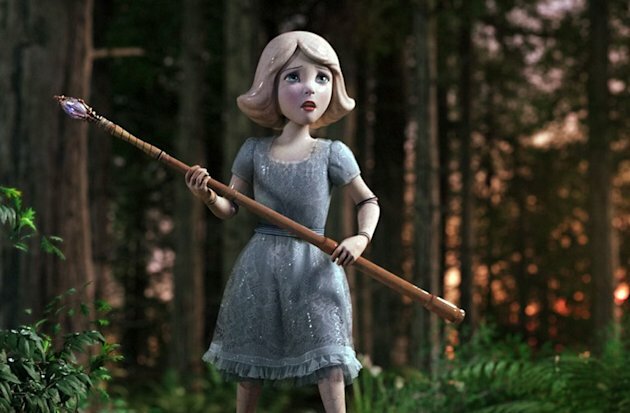 It’s certainly not a movie that represents Oz as I imagine it, but it held my interest, looked good (well, aside from Kunis’ witch costume), and had some true moments of cleverness. I particularly liked the Wizard’s defeat of the witches through humbug and technology. Not bad, but so much more could be done with Oz in film. Do we really need to see Winged Monkeys over and over again when the series has so many other equally inventive characters and ideas? This entry was posted in Characters, L. Frank Baum, Oz, Oz Authors, VoVat Goes to the Movies and tagged china country, china girl, dorothy and the wizard in oz, glinda, margaret hamilton, mgm, michelle williams, mila kunis, oz: the great and powerful, rachel weisz, smith and tinker, the patchwork girl of oz, the wizard of oz, wicked witch of the east, wicked witch of the west, winged monkeys, wizard of oz. Bookmark the permalink. I enjoyed the movie for the Sam Raimi spectacle and silliness of it, but it really seemed like Joe Roth’s baby, and it was obvious from the previews that they were basically prequeling the MGM movie because apparently that’s all there is. It was like he wanted to do Wicked without paying all that money to get it. The problem is Baum had so many inventive characters and ideas, but Joe Roth doesn’t. I know I gave it three and a half stars because I had such a good time seeing it, but it’s mostly just cute and it doesn’t have the same pull for me to keep returning to it as many of Raimi’s other movies. In a couple of years it’ll seem ponderous and dull. I’m still hoping for someone to just take the damn book and film it the way it’s written and go from there, without dredging up the MGM movie and quoting from it constantly. I remember reading that an earlier script for the film did include some other Baum creations, including some of the monsters from The Emerald City of Oz, but none of them ended up in the finished movie. I agree with you and with Samuraifrog. This was a movie I could like but couldn’t love. I enjoyed it, but it was all in all a disappointment. It’s only on the map we see briefly in the movie that the China Town is in the Munchkin Country. The movie itself really didn’t give much sense of place at all, so it kind of didn’t even matter where the town was. Nathan brings up some points that I thought of but did not include, such as why the China Girl had no name and why Oz couldn’t use glue on everyone, although I thought it somewhat implied that many of the china people were smashed beyond repair. I did wonder if there was supposed to be a point beyond which the china people couldn’t be repaired, but I feel the movie should have specified that if such were the case. My guess is that the film’s attempt to do that was the fragmented face Oz finds shortly before finding the girl, but not particularly effective.